The earth hours of guerilla gardening have been continuing quietly (and a but more slowly in the chilly mornings lately). Earlier in the week I had a couple of interesting conversations with passersby who wondered if I might be responsible for certain things that had happened in the neighbourhood (sometimes but not always) and what had happened to those big trees on the nearby corner (cut down after tree protection legislation was changed to remove protection from them). There have been some lovely recent happenings in the neighbourhood, including installation of some wooden barriers that will stop cars parking over the root zones of a group of large eucalypts we still have, and from killing smaller plants altogether. Then, new plantings went in to replace those killed by careless parking and midsummer planting. Wonderful. 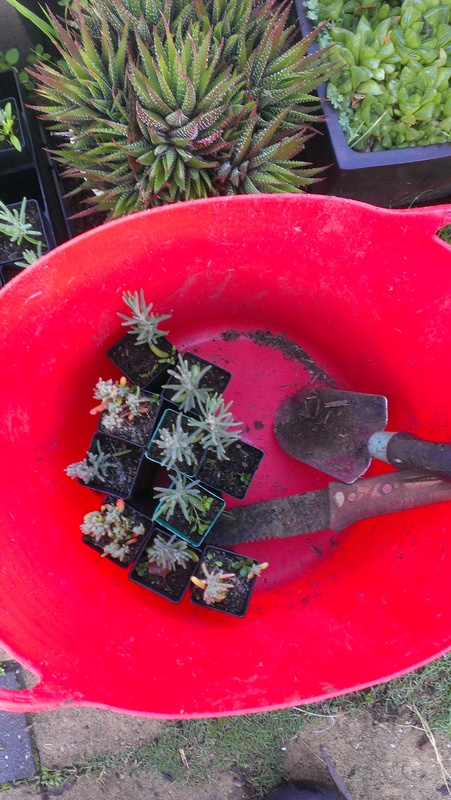 This morning there was a rainbow as I went out with my ten saltbush plants, my trowel and my fiendishly effective Japanese weeding tool. 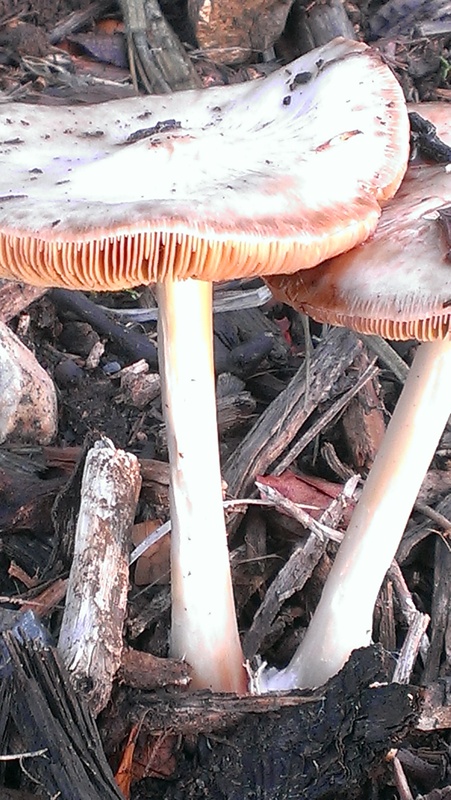 And these fungi had appeared. 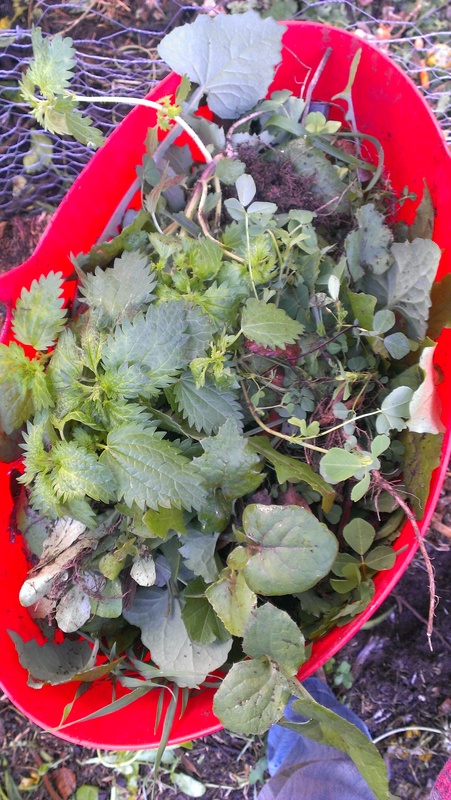 Some time later, I returned with a bucket full of weeds. More mulch has been appearing at random all over the neighbourhood, and it has become apparent that smaller plants are at risk of being buried (some I planted earlier in the week were buried the same day!) If weeds grow near little plants they are also at risk of being treated as weeds, since the poisoner doesn’t get out of his ute to check. As if to confirm my perception that now is the season for weeding, the poisoner’s truck passed twice as I worked, drawing attention to itself with the sound of its pump, and the driver was not the reluctant poisoner I’ve spoken to recently, so there is no guarantee he will recognise small saltbush as in need of protection. The weeds I pulled hadn’t been poisoned (our street came later and it was shocking to see how much poison was lavished upon it). There were lots of sow thistle and lush prickly lettuce among them, so there was chicken happiness at our place, and I treated that Japanese weeding tool to a loving handle oiling while I tried to imagine what its name might be. I failed completely to imagine what a Japanese mind might call this tool, and having bought it at the Royal Show years ago and never seen another, I don’t know its English name either, should it have one. ‘The uprooter’? ‘Stabber, foe of weeds’? ‘Defier of nutgrass’? Um, would this be your ‘killer’ tool? Looks VERY effective! Nice to see others are noticing what you are doing! Whoa! Now that’s a knife. As I had my Japanese dictionary app open I had a look and not surprisingly the name seems to stem from the verb to dig, carve or even reclaim! i have one of those…purchased in San Francisco years ago. so much easier to carry on the paddock than the “grubbing axe” when stalking toddling thistlets. as to the poisoning…you should see the yellowed paddocks abounding the very same river Torrens used as an aqueduct for the muddy waters of the Murray as they flush their way toward the Kangaroo Creek dam. despite the increasing proof that glyphosate sprays play a role in causing cancer. My skin is crawling just thinking about all that glyphosate. It was appalling to see how much was being splashed about it my own wee suburb, where it no doubt goes into Brownhill Creek eventually… BUT–hail the hori hori. Fabulous tool!